Now taking delight in heaven's graces. 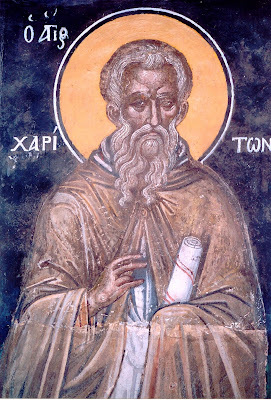 Our Holy Father Chariton was born and brought up at Iconium in Asia Minor. The Emperor Aurelian (270-6), who showed no hostility to Christians at the outset of his reign, was incited by the devil after a while to begin a violent persecution of those who called upon the Name of Christ. Chariton, whose piety and godliness were well known in Iconium, was arrested and brought before the consul when the imperial decree arrived. As he fearlessly confessed Christ and his abhorrence of idols, he was stripped, stretched out on the ground, violently scourged, and thrown into prison with his flesh torn to shreds, and he was bound to iron chains. 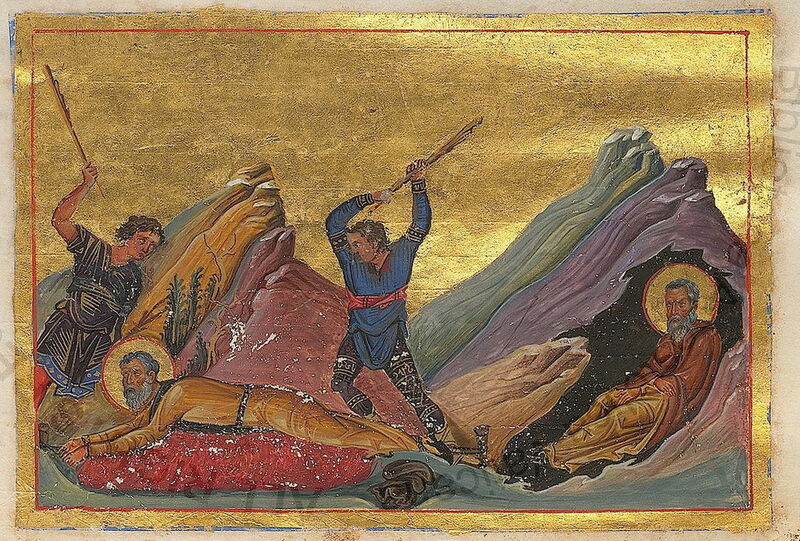 Shortly after this, Aurelian died and an imperial decree set the Confessor of Christ free. This allowed him to live a martyric life through strict asceticism. While dwelling at Pharan, Saint Chariton brought many unbelievers to embrace the faith and to follow the example of his angelic life; but he wanted to find again his beloved solitude. He therefore placed the best of his disciples at the head of the community, and exhorted his spiritual children to observe a strict temperance in food and sleep, to pray day and night at the hours he had appointed them and to receive the poor and strangers as Christ himself. He then settled in a cave on Mount Doukas near Jericho. However, he was not left to converse alone with God, for his fame spread through his holy way of life and miracles. Many disciples came to join him and he had to establish a second Lavra, before fleeing once again to a place more remote called Thekoue. 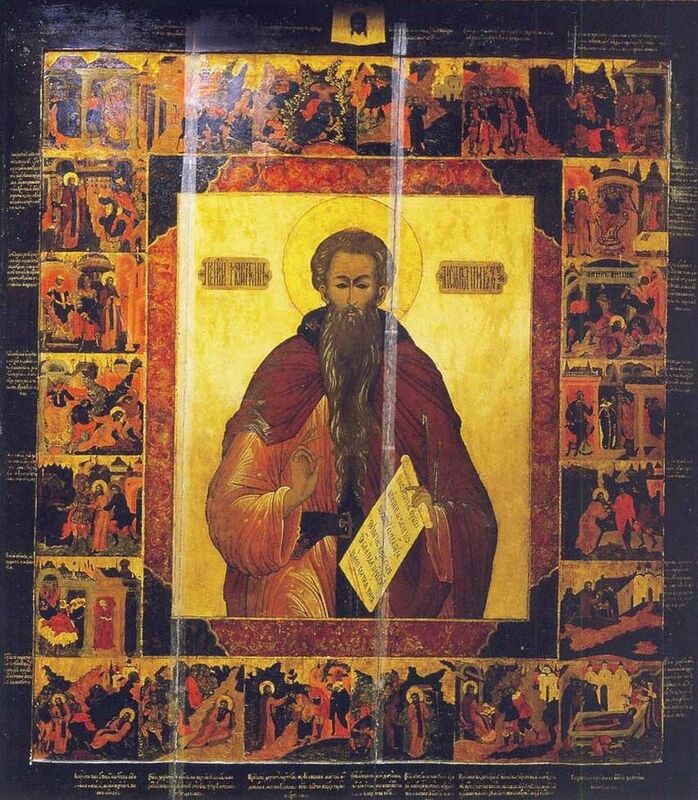 He later settled with a few disciples in a third Lavra called in Syriac Souka, or the Old Lavra. But nothing could stop the flow of new disciples and of pagans who came to taste the honey of his words, and to look upon this living image of Christ. As Chariton sought nothing but the sweetness of union with God in solitude, he withdrew to a cave above the Lavra that could be reached only by using ladders. He dwelt there for many years, taking water from a spring that flowed in the cave at his prayer. There the thrice-blessed one lived in the most extreme asceticism, and became most united with Christ, reaching the fullness of his days both physically and spiritually. Knowing beforehand the date of his death, he was brought back to his first Lavra of Pharan where, as a spiritual testament, he gave his disciples to understand that asceticism linked with humility and love towards all without exception, is the sure way to arrive at union with God. His last words spoken, Saint Chariton lay on his bed and reposed in peace in the year 350 to take his place in the choir of Angels and Saints. Portions of his relics are at the Athonite Monastery of Dionysiou and Kykkos Monastery in Cyprus. *In Palestine, a lavra was a place, originally inhabited by one or two hermits, that had grown into a monastery through the influx of disciples. O blessed Chariton, radiant with the grace of the Spirit, thou wast luminous with virtue. Thou didst shine from the desert by confession and labours. Pray for those who sing thy praises. Thou didst delight in monastic discipline, and bridle carnal desire, and didst increase in faith, O blessed Chariton. Thou hast flourished as the tree of life in the midst of Paradise.